Coffee and the way people enjoy it is always the interesting topic on international magazine. Being a Vietnamese and a long time living in Hanoi, sidewalk coffee is the first thing that recalls the charming Hanoi in my mind. Unlike some café shops, sidewalk coffee is found with standard menu but very unique taste. The drinks range from a cup of coffee, tea to orange juice, lemonade with a plate of sunflower seeds. 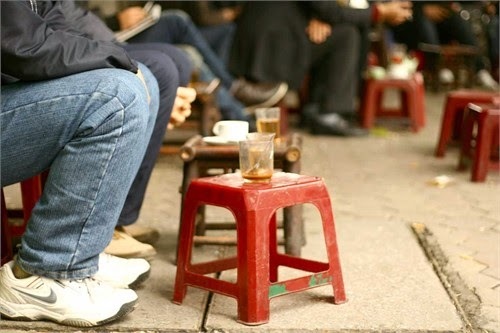 Since 90s years, it is popular that Hanoians enjoy a cup of coffee on the streets. They sit on the small stalls and even no tables with lot of noise and dust, chat with their friends. No candle, no light, no professional bartenders. From morning to late, it is where the coffee meets the flow of daily life. Frequent customers are officers, students and the elderly, from young couples to groups of men and women. 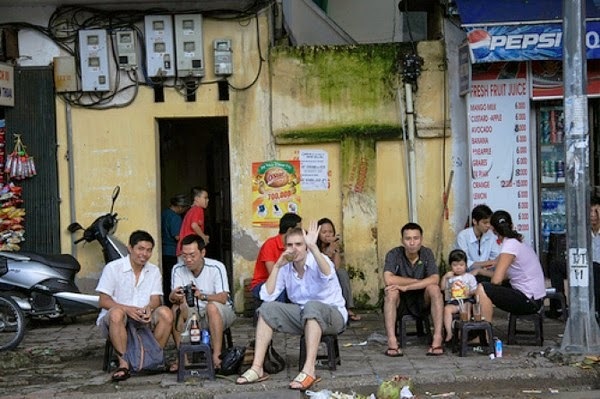 Sipping a cup of coffee, leisurely watching people passing by the crowd streets are the reasons why you should try in your luxury tours to Vietnam. Someone can pop a question of quality of café on the pavement. Don’t worry! For a long time staying, it confidently is the cheapest but even fastest and greatest drink for your choice. With only 20,000 VND you will have the tasty cup of coffee. Contrast with the delicious and excellent service in the well-decorated café shop, street cafés keep its own antique style and attracts a lot of “fans”. “I think practically can maintain its vitality because it has not just emerged like a trend – it comes at an acceptable price, with good quality and service. The café spaces are dynamic and fun, fitting the mentality of young people, since the owners of these café are mostly young people and easily understand what their peers are looking for.” said Thanh Huyen, a student of Phuong Dong University. That’s why among so many attractive Vietnam destinations, Hanoi always is a priority. Impressive post, thank you for sharing it to the world!